Norb and Marie Novocin, owners of Estate Auctions, Inc. are proud to list an incredible piece by artist Martha Walter. As with all of their listings on eBay the opening bid is only 99 cents. Similar paintings by Martha Walter have sold in excess of one hundred thousand dollars so finding a painting of this quality by a well listed artist on eBay is unique. "We handle hundreds of consignments every month and have sold some amazing paintings over the years but this one stands out. We were honored that our consignor allowed us to offer this stunning piece and we expect a tremendous amount of interest and bids on this painting", says Norb Novocin, owner of Estate Auctions, Inc. This painting depicts a great scene, full of women and children at the beach, complete with an umbrella, and even a boy in the foreground playing with a sand bucket. There are easily 23 figures in the scene. Signed in the lower left corner, it is in its original frame and has a WWI era label on the back from, Denholm & McKay Co., Boston Store, Worcester, Massachusetts. It measures approx. 14" x 11", framed approx. 17 3/4" x 14 3/4". When matched to her works that have come up at past auctions, this most closely matches to one titled, "Bathers on the Beach, Bass Rocks" which sold 10/26/2006 at Shannon's Fine Art Auctioneers for $153,100. According to public research available to Estate Auctions, Inc. the top selling price of a Martha Walter painting at live auction is $266,500. 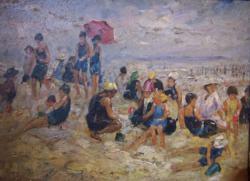 The auction for the Original Early Circa 1917 Martha Walter Oil/Board Painting, Bathers On The Beach closes Monday, May 7th, 2012. To learn more about the Novocins and Estate Auctions, Inc. visit them on eBay, user ID EstateAuctionsInc or follow them on Twitter @KnowsEbay. For consigning information call 800-573-3508. You can find their new book Getting Sold On Ebay, A Treasure Hunters Guide To Making Money at http://GettingSoldOnEbay.com or Amazon.com.